Ask Faraaz Kazi why he chose his prize winning short story from ninth standard and turned it into his debut novel, and the Mumbaikar gives a timid smile and says, “I saw potential in the story.” He is 24, and the certified soft-skills trainer who operates his own academy in Mumbai now has a love story to his credit. Truly, Madly, Deeply — that just about encapsulates the story about a broken heart. Truly, Madly, Deeply is a teenage love story that seeks to find answers to the never ending questions about ‘true’ love. The story captures the life of a pompous Rahul Kapur who is head over heels in love with Seema. But do all love stories have a happy ending? 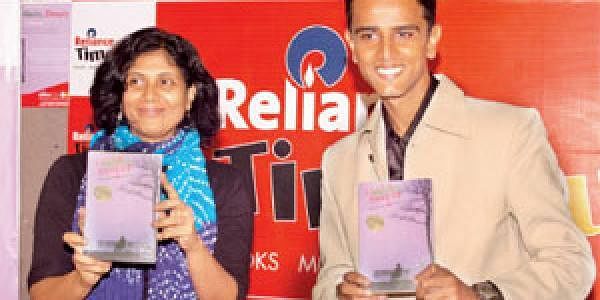 City Express caught up with the author who was at Reliance TimeOut to launch his book in the city. So the story began as a short story. How did the transition to a novel happen? I won a national essay competition in my ninth standard. Though I knew there was potential for the story to be a novel, it was only three years ago that I realised it fully. That’s after I enrolled myself for a creative writing programme. So in 2009, I started writing the novel. So, how is this love story any different from the numerous love stories that we see in Bollywood and new writings? It’s very different. It’s the kind of work that has not really been explored much. The story is about love that has transgressed into something more. You could call it obsession. I’m targeting the young audience here. But it should go down well with literary critics too. And why would you say that? Is it because you have used poetry and prose in your book, making it quite a unique attempt? I have used poetry in the form of quotes by Shakespeare and others. The story is written in two shades. The earlier part of the chapter is the present. And poetry is used to show flashback. It was a deliberate attempt. Many people told me to do away with the poetry. But I felt it was good as it sets the mood. You have incorporated all the elements needed in a love story. There is even a little bit of cricket. But aren’t the readers tired of the usual ingredients of a love story? I would say no. Ultimately, readers connect with their experiences. The way the story reads depends on how the author portrays it on paper. But every author is not able to satisfy every reader. Some people might not be able to connect with heartbreak and love. Others can, and like to read them. What in your observation do the young people of India like to read? Many young Indian writers after Chetan Bhagat started penning down their own stories. Though literary critics may not appreciate it, young people want to read it. And today, you write what the market demands. So you wrote because the market demanded a teenage love story? Mine was a different case. Seven years ago, when Chetan Bhagat was unheard of, I wrote the story. I knew what the market was expecting. I had to add a little bit of romantic elements and masala to make it more appealing now. So, can we call your book a masala entertainer? Not exactly. It is a book that will appeal to the youth as well as critics. So calling it a masala entertainer won’t be right. Yes. I am working on two books now.